These words, suggested in a song by Jimmy Buffet in his 1979 Volcano album, probably reflect the concerns of many people living near active volcanoes. Volcanoes are beneficial to humans living on or near them. They produce fertile soil, and provide valuable minerals, water reservoirs, geothermal resources, and scenic beauty. But volcanoes can be very dangerous. Where can a person go to be safe from an erupting volcano? What types of volcanic hazards might they face? These questions are difficult to answer because there are many types of volcanic eruptions which produce different types of volcanic hazards. When Mount St. Helens erupted on May 18, 1980, red hot lava did not spew out of the volcano and pour down its flanks. This perception of a volcanic eruption is a common one and is probably due in part to pictures seen on television or in books of the beautiful lava flows and lava fountains in Hawai'i. The type of eruptions in Hawai'i are known as hawaiian volcanism and are far less dangerous than the eruptions produced by Mount St. Helens. It is important to know what type of an eruption a volcano is most likely to produce so that the types of hazards produced by such an eruption can be identified. Knowledge of these types of hazards, will help determine where a person would need to go to be safe during a volcanic eruption. Volcanic eruptions can be placed into two general categories: those that are explosive, such as at Mount St. Helens, and those that are effusive, such as in Hawai'i. The most active volcano in the world, Kilauea Volcano on the big island of Hawai'i, is generally a nonexplosive volcano (though there have been occasions when it erupted explosively). Eruptions from it normally result in gently flowing lava flows, spatter cones, and lava fountains. Another type of nonexplosive volcanism is flood basalts. Lava flows from this type of eruption are extruded from fissures and cover vast areas. These nonexplosive eruptions are the least dangerous type of volcanic eruption since people rarely get killed by them (Francis, 1993). However, they are devastating and may have global consequences. 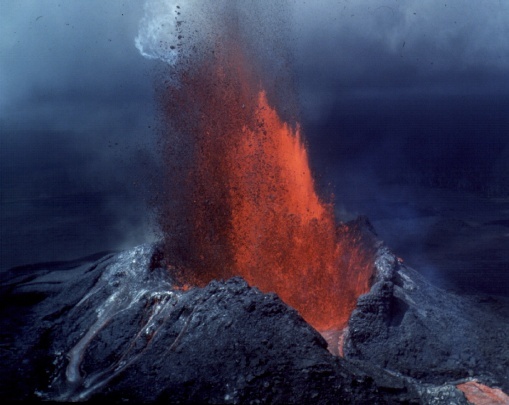 Many eruptions are explosive in nature. They produce fragmental rocks from erupting lava and surrounding country rock. Some eruptions are highly explosive and produce fine volcanic ash that rises many kilometers into the atmosphere in enormous eruption columns. Explosive activity also causes widespread ash fall, pyroclastic flows, debris avalanches, landslides, pyroclastic surges, and lahars. Explosivity is usually the result of gases expanding within a viscous lava. Another mechanism for explosions at volcanoes occurs when surface water or ground water enters a magma chamber. These eruptions are likely when a volcano occurs in a wet area or in the sea. What is a Volcanic Hazard? A volcanic hazard refers to any potentially dangerous volcanic process (e.g. lava flows, pyroclastic flows, ash). A volcanic risk is any potential loss or damage as a result of the volcanic hazard that might be incurred by persons, property, etc. or which negatively impacts the productive capacity/sustainability of a population. Risk not only includes the potential monetary and human losses, but also includes a population's vulnerability. The definitions of hazard and risk are not well-defined. For a more complete discussion of the definitions, please click here. Tilling and Lipman (1993) estimate that 500 million people will be at risk from volcanic hazards by the year 2000. In the past 500 years, over 200,000 people have lost their lives due to volcanic eruptions (Tilling, 1980). 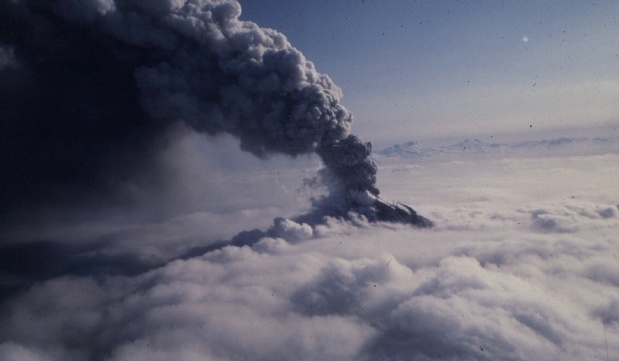 An average of 845 people died each year between 1900 and 1986 from volcanic hazards. The number of deaths for these years is far greater than the number of deaths for previous centuries (Tilling, 1991). The reason behind this increase is not due to increased volcanism, but due, instead, to an increase in the amount of people populating the flanks of active volcanoes and valley areas near those volcanoes (Tilling, 1991 and Hall, 1991). The following is a list of volcanic hazards. Click on the one that you are interested in learning about. In recent years, with the eruptions of Mount St. Helens and Mount Pinatubo many advances have been made in the study of volcanoes particularily in eruption prediction. The problem with volcanoes is that, though there may be similarities between volcanoes, every volcano behaves differently and has its own set of hazards. That is why it's important for scientists to study and monitor volcanoes. Many active volcanoes near populated areas have not been sufficiently studied to assess risk. When scientists study volcanoes, they map past volcanic deposits and use satellites to look at volcanic features, ash clouds, and gas emissions. They also monitor seismic activity, ground deformation, and geomagnetic, gravimetric, and geoelectrical and thermal changes at a volcano. They study and monitor volcanic gases and monitor the temperature, flow rate, sediment transport, and water level of streams and lakes near the volcano. By studying volcanic deposits, scientists can produce hazard maps. These maps indicate the types of hazards that can be expected in a given area the next time a volcano erupts. Dating of these volcanic deposits helps determine how often an eruption may occur and the probability of an eruption each year. Monitoring of a volcano over long periods of time will indicate changes in the volcano before it erupts. These changes can help in predicting when an eruption may occur. The main reason scientists study and monitor volcanoes is so that those living near active volcanoes can be aware of the hazards produced by volcanoes. This awareness will hopefully prevent loss of life and property when an eruption occurs. It is important that scientists communicate with local government officials and the general public about hazards produced by the volcanoes in their area. This interaction and the developement of an emergency plan with established lines of communication will hopefully save lives and encourage better land use planning.